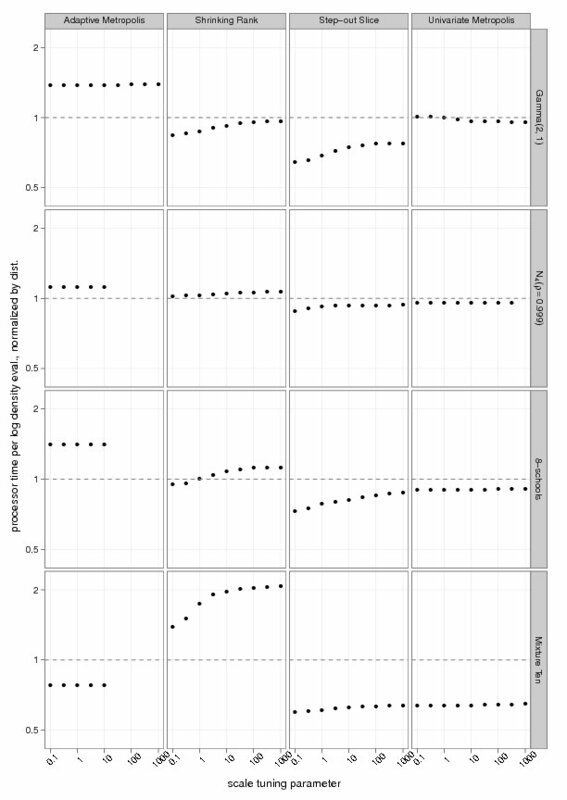 A new posting on arXiv by Madeleine Thompson on a graphical tool for assessing performance. She has developed a software called SamplerCompare, implemented in R and C. The graphical evaluation plots “log density evaluations per iteration times autocorrelation time against a tuning parameter in a grid of plots where rows represent distributions and columns represent methods”. 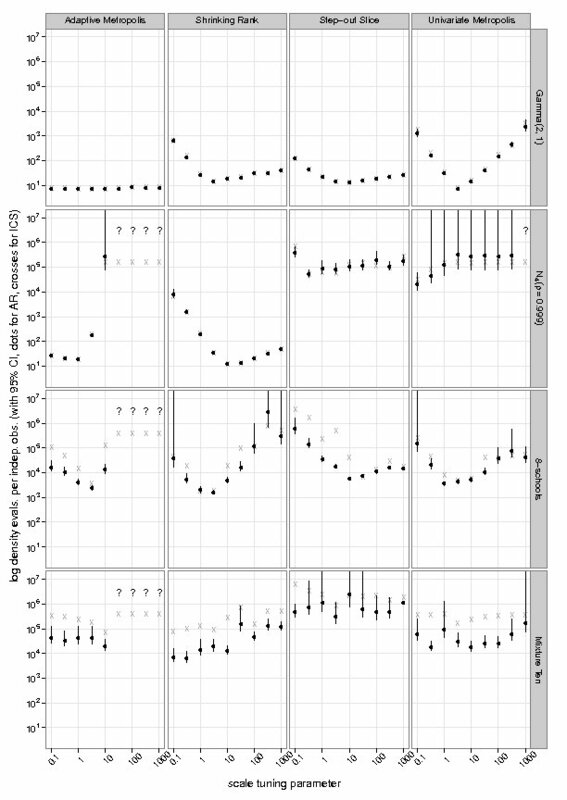 The autocorrelation time is evaluated in the same way as coda, which is the central package used in the convergence assessment chapter of Introducing Monte Carlo Methods with R because of its array of partial (if imperfect) indicators. 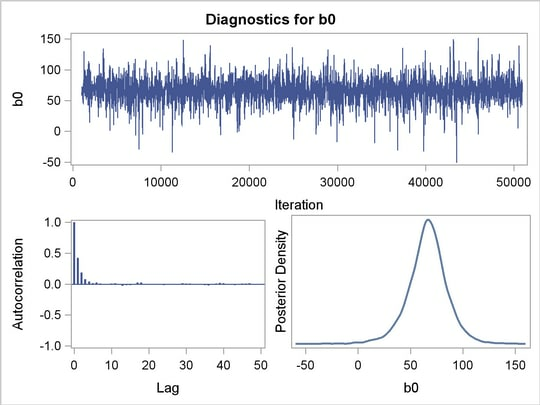 Note that there is an approximation factor in the evaluation of the autocorrelation time because the MCMC output is represented as an AR(p) series, with a possible divergence artifact in the corresponding confidence interval if the AR(p) process is found to be non-stationary. When the simulation method (corresponding to columns in the above graphs) allows for an optimal value of its (cyber-)parameters, the performances exhibit a clear parabolic pattern (right graph), but this is not always the case (left graph). Graphical tools are always to be preferred to tables (a point Andrew would not rebuke! ), However I do not see the point in simultaneously graphing the performances of different MCMC algorithms for different targets. This “wasted” dimension could instead be used for increasing to at least three the number of cyber-parameters evaluated by the method. Specify Bayesian analysis for ANOVA, logistic regression, Poisson regression, accelerated failure time models and Cox regression through the GENMOD, LIFEREG and PHREG procedures. 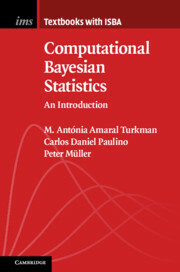 Analyze a wider variety of models with the MCMC procedure, a general purpose Bayesian analysis procedure. Even though I have not looked at a SAS program since the time in 1984 I was learning principal component and discriminant analysis by programming SAS procedures on punched cards, it seems the MCMC part is rather manageable (if you can manage SAS at all! ), looking very much like a second BUGS to my bystander eyes, even to the point of including ARS algorithms! The models are defined in a BUGS manner, with priors on the side (and this includes improper priors, despite a confusing first example that mixes very large variances with vague priors for the linear model!). The basic scheme is a random walk proposal with adaptive scale or covariance matrix. (The adaptivity on the covariance matrix is slightly confusing in that the way it is described it does not seem to implement the requirements of Roberts and Rosenthal for sure convergence.) Gibbs sampling is not directly covered, although some examples are in essence using Gibbs samplers. Convergence is assessed via ca. 1995 methods à la Cowles and Carlin, including the rather unreliable Raftery and Lewis indicator, but so does Introducing Monte Carlo Methods with R, which takes advantage of the R coda package. I have not tested (!) any of the features in the MCMC procedure but judging from a quick skim through the 283 page manual everything looks reasonable enough. I wonder if anyone has ever tested a SAS program against its BUGS counterpart for efficiency comparison. It does not tell you how to select a prior. There is no correct way to choose a prior. Bayesian inferences require skills to translate prior beliefs into a mathematically formulated prior. If you do not proceed with caution, you can generate misleading results. It often comes with a high computational cost, especially in models with a large number of parameters. which does not say much… Since the MCMC procedure allows for any degree of hierarchical modelling, it is always possible to check the impact of a given prior by letting its parameters go random. I found that most practitioners are happy with the formalisation of their prior beliefs into mathematical densities, rather than adamant about a specific prior. As for computation, this is not a major issue.